This list doesn’t need much introduction, though I should probably mention that my original plan was to put together a post with just ten apps for healthy foodies. It quickly became impossible to narrow it down that far, as there are just so many top-notch apps out there these days. You may have heard of some of these, but I expect you’ll find at least a few new gems in this list. (Many thanks to everyone who sent me suggestions!) Of course, if I missed any essential apps, and I’m sure I did, please let us know in the comments. Click the “Alternatives” tab for suggestions of better products, or you can compare two products to help you decide which to put in your cart. Scan any barcode in the grocery store (their database is already over 250,000 items), and it should give you clear nutritional information. I particularly love that you can keep a list of ingredients you want to avoid, and the app will warn you if it’s in one of the items you scan. Unfortunately, the database still needs work… I scanned six or seven items in my fridge, and it only recognized one of them. Once they work out a few kinks, I have faith it’s going to be great. Good Guide has rated tens of thousands of products (not just food) according to health, environmental, and social performance. Everything gets a score from 0 to 10; the higher the better. All the scores are available on their website, but you can use the mobile app when you’re at the store to quickly scan a product’s barcode and see how it stacks up. This is a mobile version of the Center for Science in the Public Interest’s Chemical Cuisine website — which is one of my go-to resources. It lists over 130 food additives with their descriptions and safety ratings to help you make healthful decisions, and will update automatically when new information is available. In the genre of “Healthy Eating as Social Networking Game,” Pic Healthy is easily one of the leaders. It’s a food photo diary app that lets you take pictures of food, rate how healthy or unhealthy it is, and then share with your friends and get their opinions — and then earn or lose points. If you have friends who want to play along, this could be a great way to stay healthier as a team. I’m not completely in love with this app, but it’s a start. Their database includes mostly large chain restaurants (and lots of fast food) — making a few recommendations for healthier menu options. In a pinch, it could prove helpful. This is the essential guide for making more sustainable choices when buying seafood. With the exception of a few species (Wild Alaskan Salmon! Wild Alaskan Halibut! ), I have trouble remembering which fish are the way to go, and which are the best to avoid (Swordfish! Orange Roughy!). This app recently received a full makeover, and it’s now much faster and easier to use. 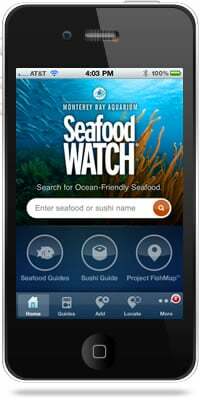 Just type in the seafood into the searchbox, and you’ll instantly have the Monterey Bay Aquarium’s expertise and guidance on what to order, guilt-free. Concerned — or just curious — about Genetically Modified Food? 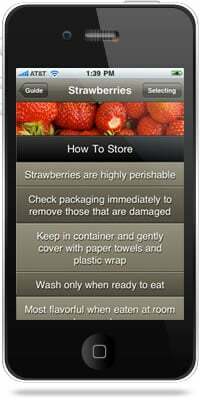 Check out this great app from the Center for Food Safety. It’s filled with tons of great information and resources, as well as ways you can take action. The Environmental Working Group’s Shopper’s Guide to Pesticides is the definitive guide of fruits and veggies with the most and least residual pesticides. Their “Dirty Dozen” and “Clean Fifteen” lists help you know which to buy organic, and which are okay to by conventionally-grown (if organic is not available). 10. What’s On My Food? 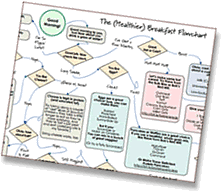 Want to dig deeper than the Dirty Dozen? This app from the Pesticide Action Network uses data from the USDA’s database of 89 different foods, pulling the most recent data (ranging from 1999 to 2007). It gets painfully specific, showing possible carcinogens, hormone disruptors, neurotoxins, and more. They separate “conventional” and “organic,” and show the residues for each. If this doesn’t convince you to buy organic, I bet nothing will. and then just scan the barcode). Pretty cool. As soon as you start this app, it finds your location and displays a list of local fruits and vegetables currently in season (and what’s coming up soon). In Southern California, it’s a long list (only one month left for Chard and Kumquats! ), and spot-checking a few other areas showed at least some good options. It also incorporates a farmer’s market finder, which quickly found several locations near home. Oh, and when you eat locally you can use Locavore to share on Facebook, and show off just how awesome (you think) you are. With a simple yet attractive interface, the Harvest Produce Guide shows you how to select and store your fruits and vegetables. It also indicates a typical “pesicide load,” so you can see at a glance which foods are most important to buy organic. Seasons is Locavore on steroids. It’s all about foods that are in season, but with significantly more detail than Locavore. It covers fruits, vegetables, lettuces, herbs, mushrooms, and nuts. It support the United States, Canada, United Kingdom, Australia, Western and Central Europe. It lets you search by “local” and “imported” season. It also includes an international Farmers’ Market finder, which makes this app perfect for the traveling local foodie. This app has over 200 recipes that can all be customized to be made allergy free. Tell the app everything you’re allergic to, and it’ll automatically adjust the recipe to include a subsitution. You can save your adjusted recipes, keep notes on your “trial & error,” create a shopping list, and more. Find Me Gluten Free helps you find gluten-free restaurants, bars, cafes and grocery stores. View menus, call, or get directions for each business. View others’ ratings and reviews and submit your own. 17. Is That Gluten Free? 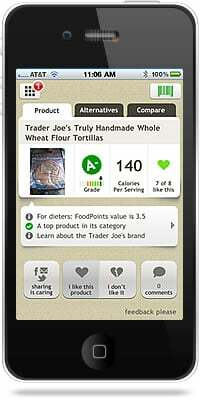 This app helps determine if foods are gluten free. You can search their database of over 23,000 items by category, brand, or product name. It has a higher price tag than most, but if you really need help finding gluten-free products, it looks to me like it’d be worth it. 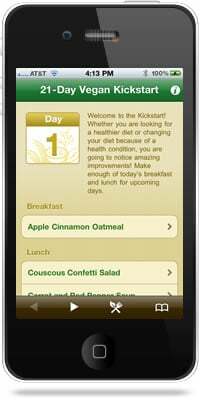 The app is a companion to the Physicians Committee for Responsible Medicine’s popular 21-Day Vegan Kickstart program. It gives you vegan recipes for every meal for three weeks (one week at a time, since they don’t want to overwhelm you). Unfortunately, the app seems to be lacking a grocery list — if they were to compile each week’s menu into a shopping list, that would be a huge improvement. But even so, if you’ve been thinking about “Going Vegan,” even if just for a little while, PCRM has got your back. Searching the Happy Cow database, this app helps you find vegetarian, vegan, & veg-friendly restaurants nearby. You can filter by “Veg-Type,” and it suggests restaurants in over 90 countries. I had a chance to demo this app a few weeks ago, and I must say it’s pretty slick. While not specifically showcasing healthful recipes, some of the features were impressive enough that I wanted to include it in this list anyway. I particularly like the “Prep Mode” feature, which lets you use voice commands (“On screen!”) to walk through each step of a recipe, keeping your greasy paws off your expensive iPad screen. This is the app version of Mark Bittman’s How to Cook Everything. With a title like that, it obviously needs to have some serious content to back it up, and it most certainly does. Best of all, it’s filled with useful information that’s presented in Bittman’s informative yet approachable style (“14 More Kitchen Tools You’ll Probably Want!”). (See Also: How to Cook Everything Vegetarian). Featuring 50 of their “all-time best” recipes, it includes ingredient reviews, how-to videos, shopping lists, and recipe timers. Subscribers have access to more recipes. This Healthy Recipes app by Spark People lets you browse and search thousands of recipes. I particularly like that it’s all geared towards healthy eating (and they include nutrition info for each recipe). Including over 28,000 recipes from the Condé Nast family (Gourmet, Bon Appetit, etc), you can browse, search, and save your way through the kitchen. 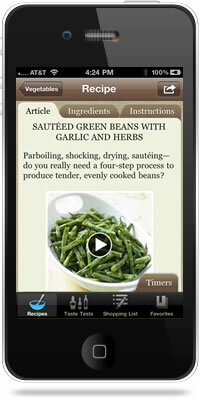 The iPad version includes nutritional information for thousands of recipes, which is a nice bonus. The Paprika Recipe Manager App lets you enter your own recipes, browse for them online (and save them to the app), plan your meals, make a shopping list, email recipes, and sync across devices (for an added fee). Lose It! helped me lose 30 pounds. Need I say more? Phew! What a list…but of course it’s by no means complete! Leave a comment and let us know your favorite healthy food app. Is “MyPlate” a step in the right direction? After LoseIt! updated and no longer works on my iPhone, I’ve been using MyFitnessPal for a couple days and it’s pretty good. It’s not as easy to use as LoseIt! 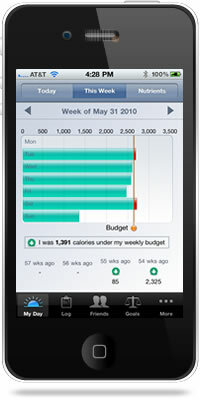 but the database of foods is huge, and so far after 2 days meals and snacks, I haven’t had to add a food yet! So now I can take the wrinkled “Dirty Dozen” and Seafood Watch cheat sheets out of my wallet and join the 21st century – is that what you’re telling me? I know this isn’t specifically a healthy app, but I love Meat Cooking Reference so I can make sure I’m not killing anyone with undercooked food no matter where I am – at work, in someone else’s kitchen, out at the grill – without finding my dogeared cookbook page. Wow! This is a fantastic list! Thanks so much for taking the time to compile it! Thanks, Erika. Glad it’s helpful for you. Love this list! It is really a great compilation. I Even found some I did not know about! Headed to check out a few new ones now….And thank you so much for including mine on the list! 😉 So so appreciated. Glad to include yours… I love the idea behind your app and hope it’s useful for lots of folks. Thanks! Fantastic list! Thanks so much for including our app! Just like Kim (above) said, there are a few here I hadn’t heard of before. About to go check ’em out!